What were you thinking in selling this Lora? Blade can't remember much in his life due to the many concussions he has had. "I miss being a child," he laments. He's again drinking a Miller Lite while his itinerary is written on a cardboard cape. RD apologizes to British listeners for thinking they don't celebrate Thanksgiving. Both November AND October. Blade still has a Big Announcement. (:08) He begs people to join Patreon so that he can be drunk/hungover full time. RD: "If every one of you listening to my voice donated just a couple dollars, we'd wind up with $24. I don't think that's enough." Blade would eat his grandmother's salmonella laced turkey in his youth. That probably explains the concussions, among other things. (:14) The two wonder when the term Black Friday came into parlance. The ever accurate Wikipedia puts it first appearing in 1951, though its shopping connotations would first appear around a quarter century later. Blade: "If it wasn't me, it wasn't me, you know? Put that on my tombstone." RD: "'If it wasn't me, it wasn't me. Here lies Blade Braxton.'" RD has always feared the day when he would not find any craziness to report, and is offended by Blade's suggestion to make something up if so. This was further exacerbated by going to a Walmart where everyone was worryingly polite, like something out of a modern horror movie. (:21) (He also advises not to use a cart, go in groups, and not vomit in the aisles like Blade once did.) So he went to Coles. There a woman fell on her head, and when he tried to help her up she apologized to him for the inconvenience. Thankfully (for RD and not the woman) in the electronics section an elderly lady was loudly lecturing some young women and by extension the whole store about bra sizes. When retelling Mrs. Deal about this he had to remind her that they were intimate, for some reason. Someone Bought This: A random Mike Rotundo photograph. (:30) Blade: "I thought you wanted a bra." RD doesn't know what size he would be. Blade: "I'm sure we both had a lower obsession with Sunny." RD: "I did not have a poster of her on my bathroom wall." RD has a lot of old stuff in his closet. Blade has some torn pants. Mickie James and her husband have a contest where someone can win a holiday ticket to see their family. (:44) Blade thinks he can win for a 15 minute car ride. He offers a 20 minute car ride ticket to be won on his Instagram page with the term #hoboholidays. Or was it #hoboholiday? I don't think even he knows for sure. Too many concussions you see. Anonymous Brooke is a second-time mother, and managed to bounce back into shape within two weeks. (:51) RD thinks Blade has illegitimate children, which he probably doesn't know about because of...you know. Amher Ali asks a Question on Blade's (non-Instagram) Facebook post about the WCW-based viability of the evil architect Bill Ding (as created by Jim Cornette and portrayed by Disco Inferno). (:55) RD would have him fight The Wall, obviously. Blade struggles because of...you know...and suggests he could hide Hacksaw Jim Duggan's 2x4 in a house or something. The Fruitcakes get to discussing past Survivor Serieses. RD fondly remembers the one he drove six hours (long) to, the Gobbledly Gooker, and Crazy Bob Backlund defeating Bret Hart. Blade remembers Demolition, Demolition, and Demolition. 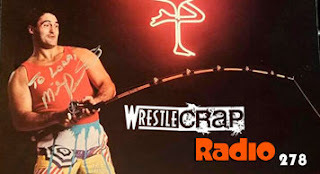 RD has no idea why WWE is bringing Starrcade back, since last time it was such a success that this year it is an hour long house show in Cincinnati. (:75) RD remembers the one time the original PPV had a Skywalkers Match in '86, possibly live from Cloud City. Blade is fond of not just his mascot the Black Scorpion, but the whole '90 show he was main eventing. The two then remember the effectiveness of the Dungeon Of Doom's masks to conceal identity. How long will Becky be out? RD: "I don't think we're quitting our day jobs anytime soon."